If you’re having problems, we’re here to help. Below are links to solutions to several common voice and phone related questions. If you do not see something that matches the issue you are experiencing, you can always contact us directly by email, this webform, or phone at (802) 885-9000. If you have questions about VTelevision, click here. We will never send you an email asking for your account information. This is a popular way that hackers try to get your account information called “phishing”. There is no reason that we will ever ask for your account information. If you do reply to one of these emails, contact us to reset your password. VoIP is an acronym for “Voice Over Internet Protocol”, a technology for communicating using “internet protocol” instead of traditional analog systems. VoIP converts analog signals into digital signals that can be sent over the Internet. VoIP can be cheaper to use than standard phone services, or even free! This results in an obvious cost-savings for long-distance calls especially. VoIP services can be taken with you as long as you have an internet connection, which is a great benefit for travelers. VoIP is robust with features including selective call forwarding, find me/follow me call routing, call screening, voicemail to email transcription, and more. 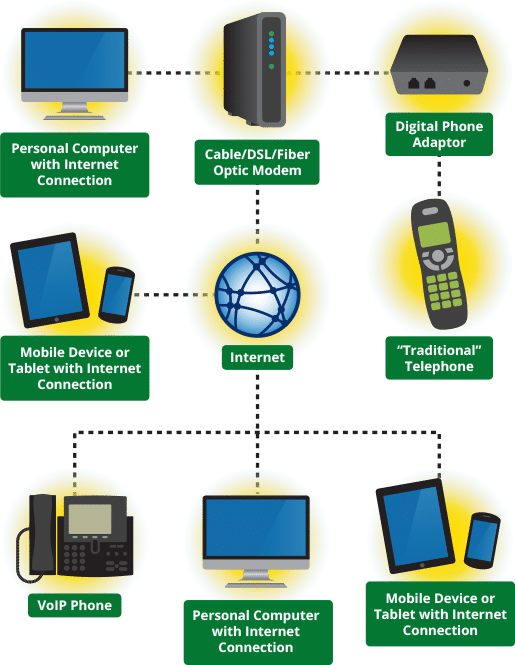 If your building is equipped with a Network Interface Device (often referred to as a “NID”) or Optical Network Terminal (often referred to as a “ONT”), you may be able to determine if your problem is inside wiring or the wiring outside your home or business. If you do not have a NID or ONT, please call VTel at 885-9000 to have a ONT installed. To test your line, simply open the outer cover of the NID or ONT. Inside you should find a standard RJ-11 telephone jack. Plug a corded phone into the telephone jack inside the NID or ONT. If you have service and are not experiencing any problems then most likely the issue is inside your home. (Important: The test port often has a plug attached. You may need to disconnect the plug by depressing the retainer clip and gently pulling forward on plug. Remember to reattach the plug once you are done testing). If you own your telephone or other related equipment and experience trouble with your telephone service, follow the steps shown here to try to isolate the difficulty before you call us to report a trouble. Check to make sure that all cords are firmly plugged in. Verify that all handsets are in place. If you cannot make outgoing calls, unplug all of your phones, answering machines, etc. At various jacks, test each phone individually by plugging it in and making a test call to a friend or neighbor. Continue until you find the phone that does not work. You may also try to use your phone(s) at a friend or neighbor’s house. If an individual phone does not work at any of your jacks or your neighbor’s jacks, the trouble is probably in that phone. If all phones work at your neighbor’s jack but not at your own, the trouble is probably in your inside wiring or outside cable. If you have difficulty receiving calls, follow the steps above and have someone try to call your line. VTel is responsible for repairs to outside cable. To avoid unnecessary service charges, be sure to check your equipment first before reporting a service difficulty to us. VTel will likely ask for you a call example, including date, time, number, dialed (exactly as dialed), and the result (ex. dead air, fast busy, can’t hear, etc.). Desk Phones: To install your phone, match the plug at the end of the telephone cord with the receptacle and insert. To disconnect the phone, squeeze the clip on the plug and pull out of the receptacle. Wall Phones: To connect your wall phone, match the hooks in the back of the telephone with the rivets on the wall mounting, push the telephone lightly against the mounting while sliding it down into place over the rivets. To disconnect, slide the telephone up to lift it off the rivets, then pull the phone away from the receptacle. Types of modular jacks other than those shown in the illustrations may be encountered. You can avoid costly wiring repair charges by subscribing to Wire Care Plus. This service is designed to take care of your inside wiring and is available to all residential customers for only $6.95 per month. Business line customers can subscribe to Wire Care Plus for $10.95 per month. Wire Care Plus service is not available to business key line or PBX customers. If you prefer, you can pay as problems arise. There is a $35.00 trip charge to dispatch a technician to determine that the problem is with your inside wiring. Hourly rates to correct a problem with inside wiring are $60 for the first half hour (minimum charge) and $20 for each additional quarter hour. Please note that while most “inside wire” is inside your home, some of it is outside, between your NID (network interface device) and the inside of your home. Upon receiving a call from a particular telemarketer, ask them to identify themselves clearly and then tell them you want your number taken off the list. Remember that it is not impolite to hang up on an unwanted caller. After informing the caller you do not wish to be called back, simply say goodbye. Pick up the telephone handset and press *57. A recording will tell you if the call trace was successful. This information is kept on file at our office for up to 20 days. Note the date and time of the call you traced. We require this information to identify the call. Call Trace is an “always on” service giving you the choice of “tracing” an annoyance call anytime day or night. The cost for each successful trace is $5.00, maximum charge per month $10.00. You must sign a release form provided to you by your local law enforcement personnel, or download it here. The local law enforcement personnel will bring the release to VTel. They will give us the date and time of the traced call. Information regarding the call will be given to them. The local law enforcement personnel will notify you with the call trace information. If the call that was traced was from a non-published telephone number, then a subpoena is required to obtain the information. You Have the Right To prosecute harassing callers. Vermont State Law makes these types of calls punishable on conviction and liable to fine or imprisonment or both.